The Conquistadors will play its inaugural women’s volleyball season in the fall and Coach James Exley has added two players who will be the foundation of the program. 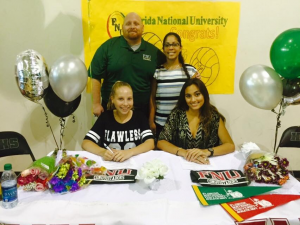 Local players, Melanie Torres and Annette Dominguez, both Hialeah Gardens High School graduates, are the first of many young ladies who will sign on the dotted lines to play women’s volleyball for the Conquistadors. Melanie will play outside hitter, but according to Head Coach James Exley, she is versatile and can play many positions if needed. Annette will play right side and is considered to be a defensive specialist. “I love her never quit attitude- she gives us a chance to win every point,” said Head Volleyball Coach, James Exley. The Conquistadors will take the floor for its first match Saturday, August 15, in a Tri-Match at Ave Maria, Florida, against Ave Maria University and College of Coastal Georgia.